Like a good neighbor....no, no, we aren't going to sing that oh so catchy jingle. But the idea behind that tune is a great one - always being there for your neighbor. I know you love your neighbors. They are the friendly folks who lend you a cup of sugar when you need it. They are the people who watch your dog when you go on a day trip. Where would you be without your neighbors? What would life be like without those friendly faces you see when you step outside your door? Well, I can tell you, I love my neighbors, and there is no better time than now to tell those people next door just how much you appreciate them since September 28th is Good Neighbor Day. This lovely celebration falls on September 28th every year. And frankly, I can't think of a better thing to celebrate. Neighbors are great, and you can always work on being a better neighbor. And it's a beautiful day in this neighborhood, a beautiful day for a neighbor...oh there I go again, another perfectly fabulous neighbor song! Mr. Rogers had it right. know your neighbors. First, the never fail method of baking. Bake a cake, some bread, or some yummy cookies and share some with you neighbor. Get the whole family involved, turn some music on, and bake your little hearts out. Nothing says good neighbor like some freshly baked goods! 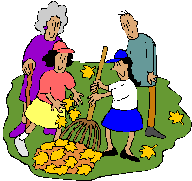 Since it is now officially fall, helping your neighbor rake up their leaves may be a nice way to show you care. This chore has a sneaky benefit for you though too - with two yards worth of leaves, the pile of leaves will be HUGE! Time to jump in! Get a little crafty - make a nice card with stickers and everything telling your neighbor just how much you appreciate them. Slip the card into their mailbox, and know that it will give them the warm fuzzies when they see your artwork. And don't forget, the library is the whole community's neighbor! We are your neighbor, and your neighbor, and even you, way in the back - we are your neighbor too! So come on in and celebrate with us. 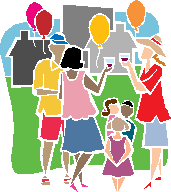 Check out some neighborly books, movies and more...see how nice we are, we share almost everything we own with our library card holding neighbors. So stop on by soon!